I know, I know, there’s enough Jubilee related posts flying round at the moment, but I thought I’d jump on the bandwagon too! 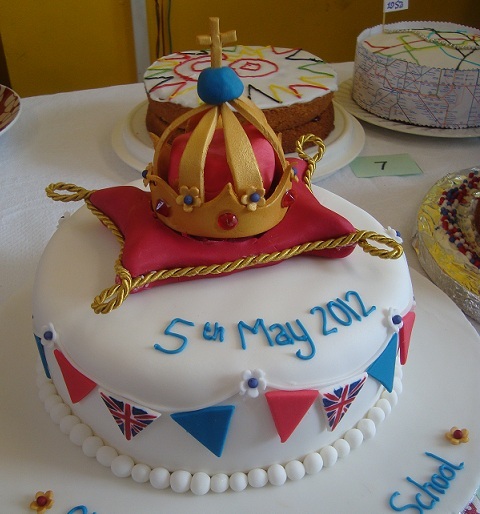 At the beginning of the month, Grace’s school held a Jubilee celebration. It was great fun, with children from all the classes taking part in dancing, singing, parades and much more. 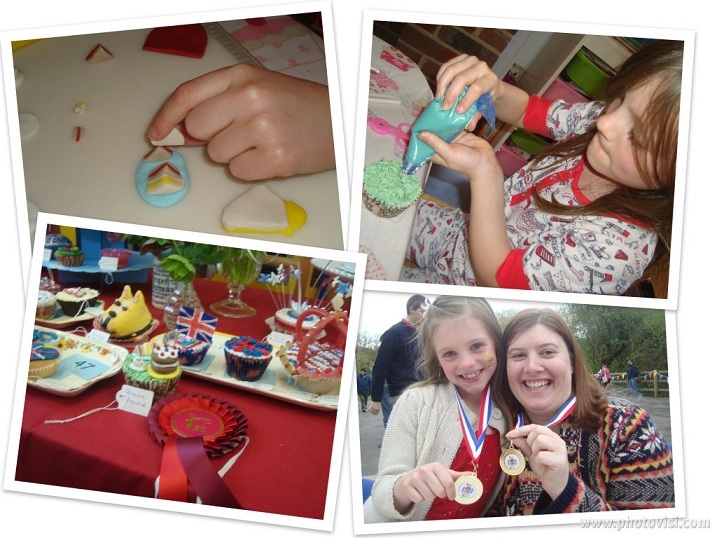 There were also several competitions including a cake decorating one for the adults and a cupcake decorating one for the children. Grace and I decided we’d both make cakes to enter into the competition. The brief for the adult category was to make a cake fit for a queen. So, as you can see from the photo above, I decided to make a gumpaste crown, sat on a sugarpaste cushion and decorated with edible gems, gold spray, flowers and hand painted bunting. I was quite pleased with the finished cake and absolutely thrilled when the chef from our local Hotel du Vin gave 1st prize to my cake! 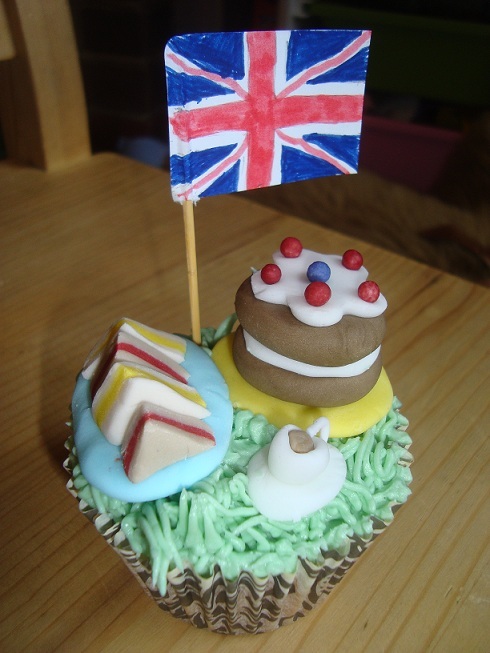 Grace decided she would do an afternoon tea themed cupcake. She painstakingly modelled little sandwiches, a tea cup and a cake out of sugarpaste with very little input from me (I had the boring job of colouring the sugarpaste to her exacting standards!). I then showed her how to pipe the grass and after a little practice, she piped the top of the cupcake. After adding her models, she made a flag out of a sticky label and a cocktail stick and she was pretty chuffed with the final result. She was even more pleased when she discovered she had also won 1st prize in her category. 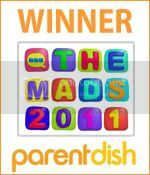 A clean sweep for the Lane Family! I have to admit it was a little embarrassing at the time but, on reflection, we should be proud as our skills are self taught and we worked really hard on those cakes! Well done girls – but sod going against you in a baking competition! superb effort on the cakes! Well done to both of you! Hope you ate that one and made more for this weekend’s celebrations!